Mi Chunche: Grounding Gus, the escape artist. Grounding Gus, the escape artist. 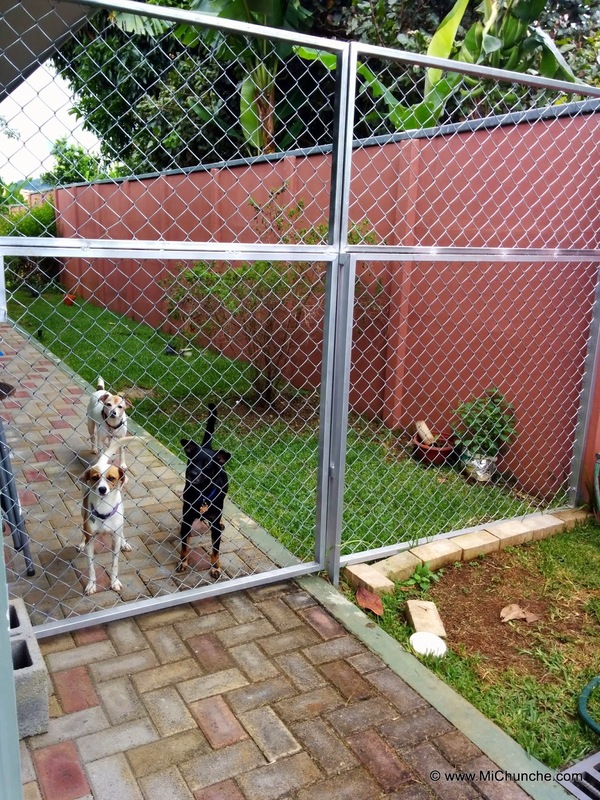 A little over a year ago we installed 2 chain link side gates on both sides of the casa. This gave us the ability to keep the dogs on one side of the yard when we have guests staying in the casita. This past month, Gus (pronounced Goose) has been showing off his leadership skills to his new little sister, Yoli (the newly rescued street dog we adopted.) Gus finally perfected his climbing technique and has managed to escape from the confines of the back yard at will. 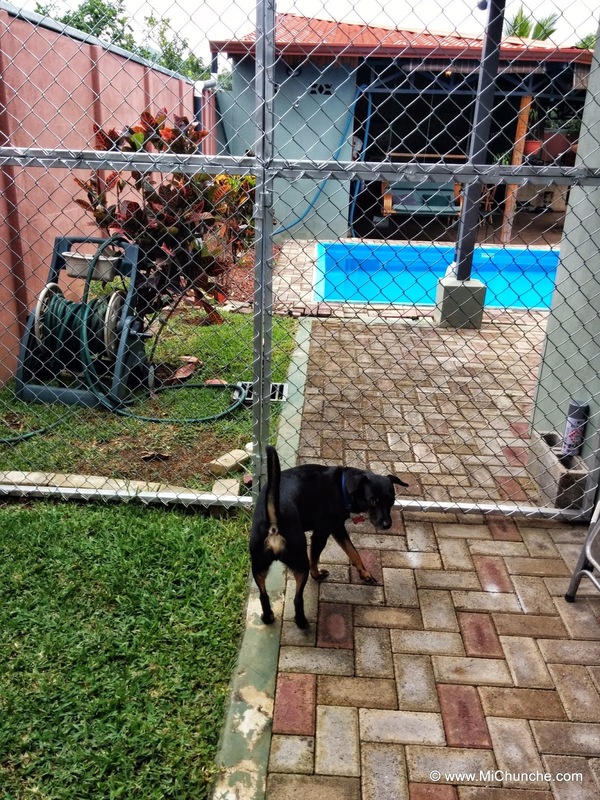 It appears Gus would take a running leap at the side of the house and then vault over the 1.25 meter gate. Rather clever actually. Yoli is actually a little taller than Gus, and she has already managed to steal food off the kitchen counter. 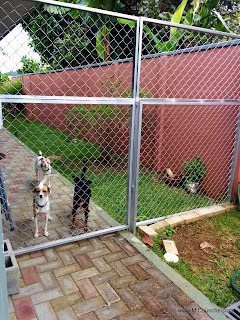 So, before Gus could teach her how to vault over the gate, we decided to intervene and put up some barriers. First, John installed wires above the gate with iron bar extensions added for strength. This did nothing to discourage him, and now we were concerned he would hang himself on the wires if his vaulting attempt failed. Next, John tied some floppy orange plastic safety fencing to the top of the gate, and this did the trick. No more attempts at escape, but it was a really ugly temporary solution. So, earlier this week, we contacted our handyman Luis. Luis built the original gates, so he came over Tuesday to discussed a permanent solution. We decided the easiest fix would be to extend the height of the gates from the original 1.25 meters to a full 2 meters high. We ordered all the materials from the local hardware store, and they delivered everything Thursday. This morning, John picked Luis up at his house, with all his tools, and a helper. Four hours later the problem is solved, and Gus' wings have been clipped. Yoli will never learn to fly. Geeze, Mom, how am I gonna jump that?!? Yoli and Gus, with Randy in the background looking puzzled at the gate. Notice the row of brick pavers at the bottom of the fence on the grass? That was to stop Yoli's attempts of going under the fence.